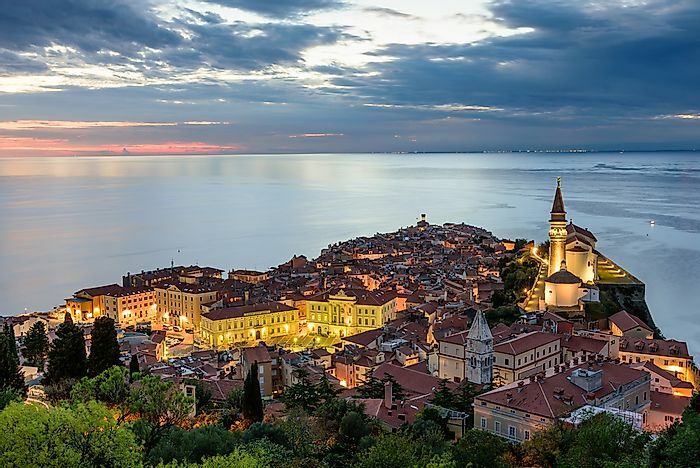 Although it has longtime been off the US traveler radar, Slovenia is becoming more popular among tourists. Photo credit: shutterstock.com. Slovenia is a central European country that offers tourists a wide variety of unique natural landscapes and features such as lakes, mountains, and the Adriatic Sea. Besides the natural landscape and features offered by the country, tourists get to enjoy and experience the Slovenian culture, history, and architecture. Some of the famous tourist destinations include historical sites such as the Radovljica Old Town and Plecnik House, museums such as the Museum of Illusions, the Kobarid Museum, and the Magical World of Shells Museum. Slovenia receives tourists mainly from European countries such as Italy, Austria, Germany, Croatia, the UK, and Netherlands as well as South Korea. The Slovenian tourism sector contributes about 13% to the GDP and provides direct and indirect population to about 12% of the workforce. Despite being miles apart, the political leadership of the US has influenced tourism in the European nation of Slovenia. Since Donald Trump took office in January, the number of tourists visiting Slovenia from the US has increased by 15%. A report by CBS News indicates that the US first lady, Melania Trump, has influenced part of this growth as many Americans visit the country to understand her roots. The growth has an overall effect on the tourism of the entire country instead of just her hometown. Various tourism agencies are using slogans such as “Welcome to the homeland of the new first lady of the United States.” Some new touristic events such as tours tracing her footsteps have been introduced. These tours trace the life of Melania Trump from when she was born until she left for the US to pursue an international modeling career in 1996. She acquired US citizenship in 2006. Besides the special tours meant to trace the lifetime of Melania Trump, tourists can also visit the nearby medieval castle as well as purchase a book about the first lady. The book, Melania trump: Slovenian Side of the Story authored by Sandi Gorisek reflects the atmosphere in the country during the communist period when Slovenia was part of Yugoslavia and its influence on Melania Trump as well as the Slovenians. The roots of Melania Trump in Slovenia have also created more awareness about the country and helped many Americans distinguish it from Slovakia. Other smaller businesses have capitalized on the Melania trump effect by introducing creative products such as the First Lady Apple Pie, Melanija Torte, and Melania Cake by the Kruhek bakery and the White House Slippers by Maja Stamol. Despite the massive turnover of American tourists in Slovenia, Melania trump has not been to her motherland since 2002. The first couple has however accepted an invitation by Slovenia’s president Borut Pahor to visit Slovenia.